The 115-pound weight class has historically been action-packed but badly overshadowed because there supposedly hadn't been a market for fighters this small, especially in the United States. That all changed with the rise of Roman "Chocolatito" Gonzalez, and while the Nicaraguan's star has faded in recent fights, one of his legacies may be the "SuperFly" series, which is now in its third incarnation. One of the three featured fights pits two-division champ Juan Francisco Estrada and countryman Felipe Orucuta in a scheduled 10-rounder. While Estrada has been near the top of his chosen weight class for a while, the 32-year-old Orucuta is rounding nicely into form as he has scored five straight knockouts -- all within five rounds -- since being stopped by Jose Cayetano in December 2015. But does he have enough "game" to upset Estrada, one of the sport's most versatile and scientific fighters? In his two most recent fights against Carlos Cuadras and Srisaket Sor Rungvisai, Estrada fell behind in the early rounds but closed strongly in the end. While Estrada's finishing kick enabled him to nip Cuadras at the finish line -- he won 114-113 on all three cards -- he couldn't close the gap enough to upend Sor Rungvisai as Dave Moretti's 114-114 score was superseded by the cards submitted by Cathy Leonard (115-113) and Steve Morrow (a ridiculously wide 117-111). How strong were Estrada's surges? Against Cuadras, at least numerically, not as much as one would think. In the first five rounds, Cuadras was more active (72 punches per round to Estrada's 58.2, including just 43 in the first two rounds), out-landed Estrada in every round and built connect leads of 116-75 overall, 42-27 jabs and 74-48 power. Estrada began his rally in the sixth by edging Cuadras 19-18 overall and capped it with a 10th round knockdown. But numerically speaking, Estrada's surge was noticeable but not overpowering, for Estrada only out-landed Cuadras 148-144 in rounds 6-12, he finished the fight behind Cuadras in every category (260-221 overall, 93-62 jabs, 167-159 power) and was less accurate overall (29.3%-28.6%) and in power shots (45%-31%). But Estrada's surge was one borne of perception; while Cuadras actually accelerated his work rate in rounds 6-12 (from 72 to 75.1 per round), Estrada's acceleration was far more dramatic (from 58.2 to 68.9, including 77 in the final three rounds) and the knockdown in the 10th cemented the narrative. The reason why Estrada lost to Sor Rungvisai is twofold. First, Estrada started his surge several rounds too late. Estrada didn't kick into a higher gear until round eight; in rounds 1-7 he averaged 47.4 punches per round to Sor Rungvisai's 63.4 and was out-landed 104-85 overall and 100-68 power. In round eight, Estrada throttled up from 42 punches in the seventh to 68 and he out-landed Sor Rungvisai 20-13 in the eighth, the first time he had done so since the first two rounds. 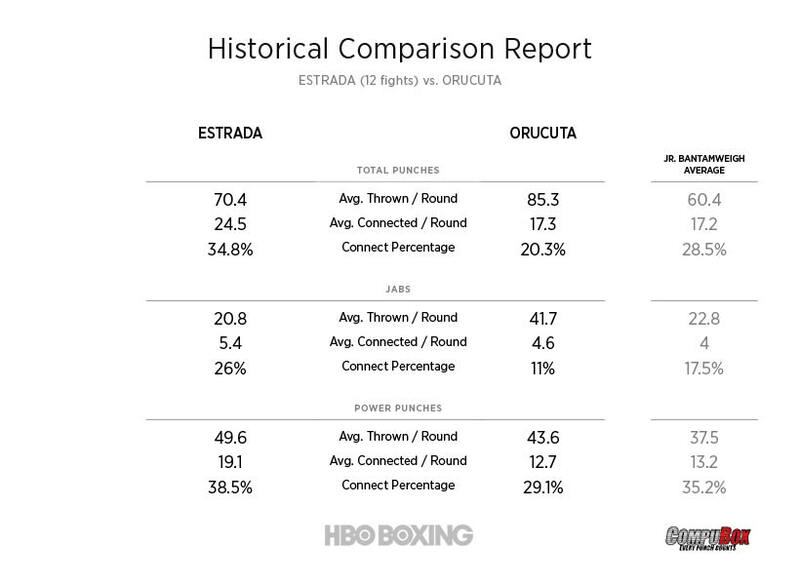 In rounds 8-12, Estrada averaged 67.8 punches per round (including a fight-high 93 in the 12th) -- a 20.4 punch-per-round increase -- and he out-landed Sor Rungvisai 104-90 overall and closed to within 86-79 in power connects. The second reason why Estrada lost was because he couldn't impose his science on Sor Rungvisai; while he still out-jabbed the Thai champion 42-8 in the fight, power punches made up a large portion of both men's output (773 of 879 punches for Sor Rungvisai, or 88% of total output, to Estrada's 443 of 671 punches, or 66%). By making Estrada fight his fight, even when the momentum was lost, Sor Rungvisai's strategic command enabled him to get over the finish line with his title intact. In the final round alone, they combined for 208 total punches (115 for Sor Rungvisai, 93 for Estrada), 187 power shot attempts (112-75 for Sor Rungvisai), 58 total connects (30-28 for Estrada) and 54 landed power shots (28-26 Sor Rungvisai). As for jabs, Sor Rungvisai was 0 of 3 while Estrada was 4 of 18. If Estrada is to win, he must start earlier and he must assert ring generalship. In his four CompuBox-tracked fights with Omar Narvaez (second fight), Jose Cayetano, Edgar Jimenez and Ricardo Roman, Orucuta's style has evolved in a way that suggests that he has tightened his flaws while incorporating more of his strengths. In the Narvaez rematch, Orucuta threw the most jabs ever recorded in a CompuBox-tracked fight at 115 (672) and threw the second-most punches in division annals (1,372) but he lost a majority decision to the then-WBO super flyweight titlist because (1) he was fighting in Narvaez's native Argentina, (2) he was out-landed 172-163 overall and 20-11 jabs (they tied with 152 power connects) because he was far less accurate (26%-12% overall, 14%-2% jabs, 29%-22%) power, and (3) he was struck by the same punch again and again -- Narvaez's stinging left cross. His tendency to be hit with the same punch also cost him dearly against Cayetano, who kept striking Orucuta with big right crosses. One dropped Orucuta at the end of round three and another nearly decked him in round six. A follow-up flurry opened a cut over Orucuta's right while also badly bruising the entire right side of Orucuta's face, injuries that prompted Hall of Fame trainer Ignacio "Nacho" Beristain to stop the fight between rounds six and seven. Also, despite being taller and rangier, Orucuta allowed Cayetano to decisively out-jab him (39.3 attempts/6.8 connects per round to Orucuta's 14.2 and 2.8), leading to a 41-17 jab connect lead as well as an 82-70 advantage in total connects. The transition seemed to occur between rounds one and two of the Jimenez fight. In round one, Jimenez out-threw Orucuta 100-42 and out-landed him 25-14, but in round two Orucuta began to box well at long range, nipping in and out and side-to-side, and in round three he hurt Jimenez badly with a sweeping hook to the jaw. His effective boxing allowed him to seize total control of the contest, and an extended flurry along the ropes prompted the stoppage. While Jimenez's output was higher (76.6 to Orucuta's 62.2), Orucuta was much more precise (45%-21% overall, 37%-7% jabs, 51%-27% power), his jab was terrific (24.3 attempts/8.9 connects per round) and his offensive versatility was outstanding. In his most recent fight against Roman, he put all of his positive elements together while virtually eliminating his past flaws. He boxed at long range throughout, jabbing with command (31.8 attempts/9.4 connects per round), producing high output (83.7 punches per round to Roman's 50.3), punched well to the body (he led 39-13), landed accurately in all phases (33% overall, 39% jabs, 36% power) and defended expertly (15% overall, 10% jabs, 16% power) en route to connect leads of 101-27 overall, 34-3 jabs and 67-24 power and the fourth round TKO, which occurred after Roman claimed a shoulder injury. No matter, Orucuta was a tremendous form and, at the same time, he created a perfect preamble for this big step up in class. Will he be able to lift his game further against Estrada? Estrada (last 12 fights- Rungvisai thru Chocolatito) landed 24.5 punches per round (#5 among categorical leaders) & 19.1 power punches (#5). 29.8% of Estrada's landed punches were body shots. Orucuta (vs. Roman, Jimenez, Cayetano & Narvaez) threw 25 more punches per round than the wgt. class avg., but landed just 20%. He can go to the body effectively though, as nearly half his landed punches (46.6%) were body shots. The version of Orucuta that fought Jimenez and Roman is no joke. He's tall, mobile, hard to hit and offensively diversified. He also stands three inches taller and will enjoy a two-and-a-half inch reach advantage. Thus he can force Estrada to abandon his preferred scientific boxing in favor of boring in and inducing a brawl. But Estrada has been a top-shelf combatant for years and that counts for something. He's also highly intelligent and he hasn't always been a slow starter, so that flaw can be fixed. If anyone can figure a way to beat the best Orucuta it's him. Estrada by hard-fought decision.